Flowers. 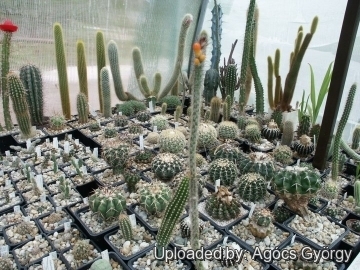 Rebutialand cactus collection Demjén, Hungary. Origin and Habitat: Arrojadoa multiflora is found in southern Bahia (Brazil) from the south of Caetite to northwest of Riacho de Santana and east of Tanque Novo. It is only known from four fragmented sites (extent of occurrence less than 5,000 km2). The subpopulations have a small number of plants (less than 250 per subpopulation) and are declining due to habitat loss. The total number of mature individuals is less than 5,000. Altitude range: It grows at altitudes between 550 and 1,400 metres above sea level. 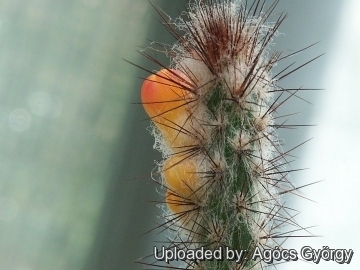 Habitat and Ecology: This cactus is found in campo rupestre and cerrado. It also grows among crystalline rocks and in sand. The generation length of this succulent shrub is ten years or less. The main threats are deforestation for agro-industry farming and urbanization. The decline has probably exceeded 30 percent in the last 30 years and is suspected to continue at the same or an even higher rate. 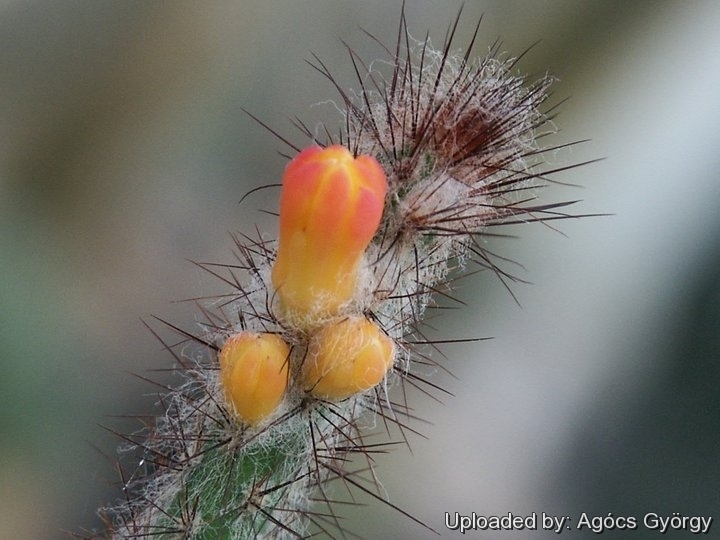 Description: Arrojadoa multiflora is a columnar cactus with slender stems, up to 80 cm tall. The stems, usually single, are covered with yellowish brown spines and greyish-white wool. Towards the apex appears a pseudocephalium (area where the flower buds and fruit are produced) composed of long, thin red bristles. The bicolored tubular flowers are pinkish-red or carmine-red with many petals. Flowers bloom at night. Hunt et al. (2006) indicated that this taxon was best assigned to either Arrojadoa dinae or Arrojadoa eriocaulis, but thought the latter to be the most likely. Other authors consider Arrojadoa multiflora a good species. Derivation of specific name: The species name multiflorus = multiflorum describes the numerous flowers that appear on plants. Stem: About 80 cm long, erect, 10-20 mm thick, glossy dark green. Ribs: 7-8, 2-3 mm high, dull. Areoles: 4-7 mm apart, 1-2 mm wide, circular, white, with downwardly facing white hairs, 5-10 mm long. Radial spines: 12-15 needle-like, brown or rusty-red to white pointing sideways 5-10 mm long. Central spines: 1 to 3. Cephalia: Towards the apex, lateral on a somewhat thickened part of the stem, with enlarged areoles, densely filled with white wool and many soft rust-red bristles 15-30 mm long. Flowers: About 3 cm long; tube 11 mm long, 4 mm wide, pale inside, outside somewhat ruby, with very little scales; filaments of the same colour of petals 4-8 mm long; anthers small golden yellow; pistil of the same colour of petals 22 mm long, stigma lobes 5,2-3 mm long; petals straight, pointed, outer ones about 7 mm long, 3-4 mm wide, pale yellow with a crimson mid-stripe; inner ones 5 mm long, 2.5 mm wide, very pale yellow. The species is self-fertile. Blooming season: Flowers appear in flushes during the growing season. Fruits: 12-15 mm long, 8 mm wide, brownish-red, club-shaped. The fruits remain long on the plant. Seeds: 1.5 mm long, 1.2 mm wide, 1 mm thick, blackish. 4) Machado, M. 2013. Arrojadoa multiflora. The IUCN Red List of Threatened Species. Version 2015.1. <www.iucnredlist.org>. Downloaded on 09 June 2015. Cultivation and Propagation: Arrojadoa multiflora is not particularly difficult on own roots providing it is given a little extra heat during the winter, but this and all its relatives do best when grafted. Watering: It should be watered generously during the growing season, keep dry in winter. Water them less than average if in bigger pots, small pots preferred.